Available on ASUSTOR NAS, Seagate IronWolf Health Management improves system reliability by offering comprehensive embedded analysis and recovery software. Taipei, Taiwan, July, 25, 2017 –ASUSTOR, a leading maker of network-attached storage, in collaboration with Seagate Technology plc (NASDAQ: STX), a world leader in storage solutions, have announced today, the availability of IronWolf™ Health Management for ASUSTOR Data Master (ADM) 3.0. Seagate’s IronWolf Health Management improves system reliability through comprehensive embedded analysis and recovery software to provide intelligent analysis of drive health that goes beyond traditional diagnostic tools. “We’re dedicated to bringing specialized solutions to the growing NAS market, and our collaboration with ASUSTOR continues to make this possible,” said Matt Rutledge, senior vice president of marketing at Seagate. IronWolf Health Management improves system reliability by offering three distinct benefits to ASUSTOR NAS: prevention, intervention and recovery. 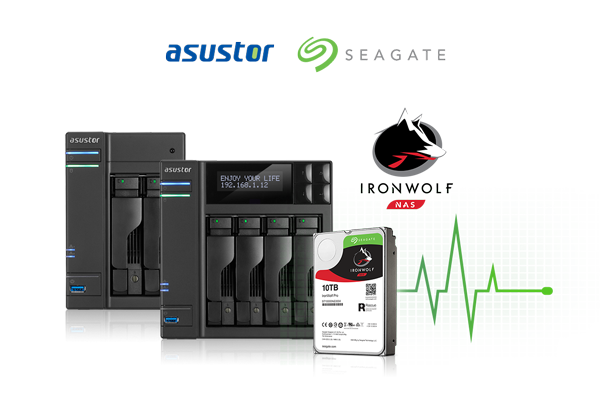 The software continually inspects the health of ASUSTOR NAS drives throughout their useful life by monitoring key parameters, along with intercepting, containing and rapidly resolving issues. Additionally, the IronWolf Health Management provides easy access to Seagate’s in-house data recovery services. IronWolf Health Management aims to actively protect ASUSTOR NAS by monitoring and analyzing environmental and usage conditions, deploying algorithms that measure critical drive health parameters. Leveraging information gathered from additional operating conditions like temperature and humidity, IronWolf Health Management also recommends preventative actions users can take to avoid having issues arise in the first place.